Do you have a passion inside of you and giant aspirations for life? If David Otunga can’t inspire you to reach for your dreams, no one can. 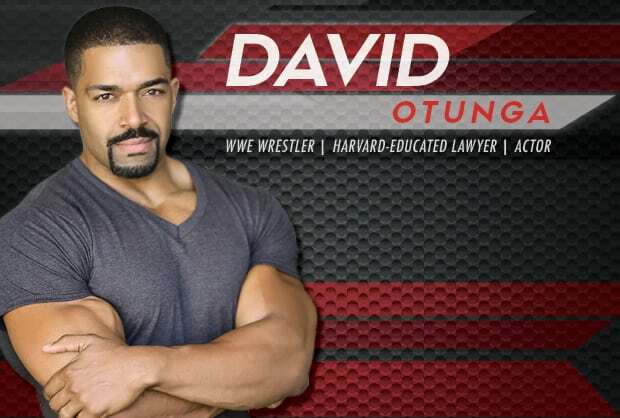 David Otunga is an actor, professional wrestler, reality TV star, a CNN legal analyst, and Harvard-educated lawyer. Despite his list of interesting job titles, David describes himself as a regular guy who was able to achieve all of his dreams because he never let obstacles get in his way. He believes that students have a choice to overcome their own obstacles to turn their dreams (no matter how large) into a reality. David Otunga is an actor known for his role in the movie The Call, a WWE professional wrestler, reality TV star, and Harvard Law School-educated lawyer. During David’s WWE career, he has become known for his impressive physique, earning him a top spot (#6) on WWE’s list of the Greatest Physiques of All Time. David has been featured in countless fitness magazines and fulfilled a childhood dream by gracing the cover of the December 2013 issue of Muscle & Fitness. He enjoys being Steve Harvey’s nutrition expert and “Personal Fitness Guru.” With big dreams and determination, David has transformed his body and life – overcoming bullies, doubters, and stereotypes along the way. He speaks to college students across the country, encouraging them to believe in themselves, set goals, and follow their dreams. David holds a Doctorate of Law from Harvard Law School and has a Bachelor’s degree in Psychology from the University of Illinois. He lives in the Chicago area with his partner, Jennifer Hudson, son, and three dogs. My favorite part of #MadeaFamilyFuneral was learning my grandma wants to bang @DavidOtunga. Even as a little boy, David Otunga knew he wanted to become an entertainer. Despite being picked on relentlessly by his peers, David never compromised his dreams and goals. Following his graduation from Harvard Law School and becoming a lawyer at one of Chicago’s top law firms, David decided to take a leap of faith and follow his dreams of becoming a professional wrestler. He turned his dreams into a reality and became a World Wrestling Entertainment (WWE) superstar and body builder. By sharing his story and transformation from a regular kid into a worldwide celebrity, David inspires students to set huge goals and shares with them strategies to achieve them. Perfect for Black History Month, anti-bullying programs, career development seminars, and programs on men’s issues and masculinity, David’s keynote will push students to set lofty goals and prove to them that with hard work, determination, and perseverance, they can reach their dreams. how breaking down barriers and never settling for “no,” they can achieve their dreams. So many students today have a negative self-image. They don’t think they’re smart enough, tall enough, attractive enough, or good enough to please others around them, or more importantly, to please themselves. David Otunga knows better. He empowers and encourages audiences to realize that what naysayers and bullies think doesn’t matter nearly as much as what you think of yourself. David works to encourage students in his audience to realize that people will experience all kinds of bullying at all stages of their lives and to learn that if you buy into the negativity you will start to believe it and it can manifest. However, if you believe that you are a great person with amazing talents, then that’s what you will become. Through his keynote, You Are What You Believe You Are, David helps students learn how to keep a positive mindset and to use different tactics to maintain a positive self-image that will ultimately lead them to become the best versions of themselves. ways to develop their positive self-image that will help them become the best version of themselves.